Leaders from around the area will be learning and discussing education issues to improve instruction and foster school improvement. There will be a variety of topics including Special Education, School Leadership, School Improvement, Common Core State Standards, Smarter Balanced Assessment Consortium, Teacher Evaluation, Educational Technology and many more. The West Michigan Education Leadership Conference will focus on practical proven techniques to assist the leader in the field! There will be a working lunch provided. For more information on this conference please visit the website. Dr. Anthony Muhammad is one of the most sought after educational consultants in North America. He currently serves as the CEO of New Frontier 21 Consulting, a company dedicated to providing cutting-edge professional development to schools all over the world. He served as a practitioner for nearly twenty years. 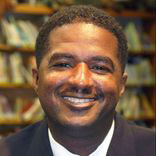 Dr. Muhammad served as a middle school teacher, assistant principal, middle school principal, and high school principal. His tenure as a practitioner has earned him several awards as both a teacher and a principal. Benjamin Gilpin is the principal at Warner Elementary in the Western School District. Warner Elementary is located in Spring Arbor, Michigan. He is a student-centered educator that is focused on collaboration, teamwork, student engagement and leadership.